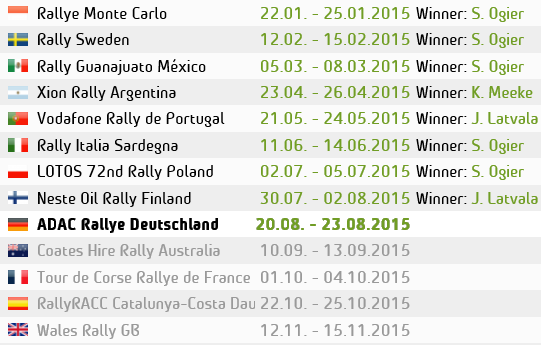 Huge drama on the opening stage for Day 2 of Rally Germany. After the 1st two Stages yesterday Volkswagen went into day 2 with a 1 – 2 lead with ogier leading the way. But on the first stage of this morning Ogier braked to late into a hairpin and went straight off the road. He managed to continue on to the end of the stage but the damage had been done, broken wheel, puncture and suspension damaged, drops 2 and a half mins. Having to let his team mate pass him on the stage. Elsewhere Mads clipped concrete block after going wide on the exit of a corner and picked up a broken wheel. PG Andersson Stopped in stage. Kosciuszko hit something and hurt his back and can’t use hand break coz his in to much pain, Al-Quassimi also broken wheel after hitting a kurb…..
Latvala leads, Neuville 5.8 seconds behind. And that was just the 1st stage of today! !